Don't you know how much help the continues ping feature in checking the uptime of a remote server? If you want to check the uptime of a destination device, you can check it from your computer by performing continuous ping. You can check the uptime by analyzing the ping reply. There is a syntax for continues ping from your computer to any IP address and you have to stop the operation manually in case you don't want your computer to ping the IP any longer. To do it from your command prompt, you can use -t syntax, and you must use the combination of keys [Ctrl] and [C] to stop the process. Here we send an unlimited number of ICMP Echo requests to a host using the command provided above. You can see the result from the picture given below. The above command will send continues ICMP Echo requests to Google until you stop the operation manually by pressing [Ctrl] and [C] buttons. The below screenshot will show you more ideas about the result of continues ping operation. 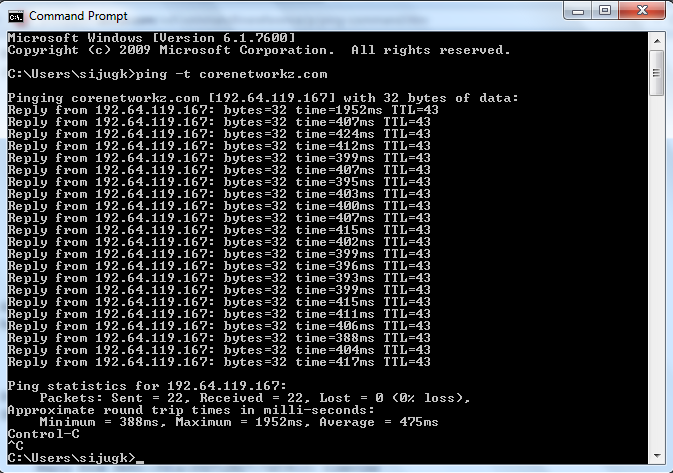 I send ping packets continuously to our blog, and the screenshot shows the result. You can use both the domain name and the IP address to perform the continues ping operation. Just like changing the default number of ICMP echo requests, you can also change the default TTL value of ICMP Echo requests send from your computer. To learn more about it, click on the link below. Sometimes destination device's firewall is configured in a way to find out continues ICMP Echo requests from a source and terminate it. In that case, we will get an invalid reply from the destination device. How to Setup Siemens SpeedStream Modem With Bell PPP DSL? One of such error message is The Connection was Terminated by the Remote computer Before it Could be Completed. What is Idea 4G APN Settings For Android Phone? How to Bypass Vista Admin Password? In some cases, while performing continues ping a destination, you may get host unreachable error message. What is Request Timed Out Error? What is Destination Net Unreachable Error? It means ICMP Echo requests send from your computer could not find the remote host. How to Change the Default Size of Ping Echo Request? How to Use Google Chrome Browser To Access A Remote Computer? How to Solve 169.254.0.0 Error? If you see this error message while contentiously sending packets to a destination, instructions provided in the below link will help you to fix the issue. Does this method consider an attack in the ping destination's point of view ? Hi Rob, can you explain your point a little more?